5 C 4 3rd fretfr. 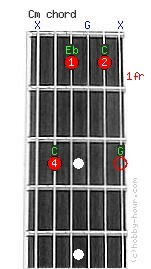 1 x or G 3rd fretfr. optionalopt. Chord Cm notes: C, Eb, G, C and (G). You should not play the 6th string. The note G on the first string is not required, but can be played on the 3rd fret if needed. The string 3 (G) is left open. Cmin, C-, (Do minor, C moll).